An interview with Gareth Stephenson, one of the co-founders of a new generation lawyer directory, Top 3 Legal, that launched recently. Gareth, can you introduce yourself. Tell us a bit about yourself and your background? 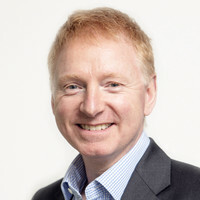 I spent most of my career at Freshfields, about 30 years – 20 years as a partner. Latterly I was involved in the setting up of the Freshfields legal services center in Manchester. What gave you the idea to start Top 3 Legal? It came about when I and some old Freshfields colleagues realized that we all felt similar frustrations with the legal directories. Two of us had worked in law firms and one was a FTSE100 general counsel. We felt that in the modern world if you were starting with a blank piece of paper, you would create something that works for each of law firms, lawyers and clients. Then we did some market research that backed up our initial view that in particular clients will instruct lawyers based on peer-to-peer recommendations. So you’re not excluding any lawyer from being on the platform. Anyone can join? Yes, as long as they are practicing lawyers, any lawyer worldwide can join and get a basic profile, build their market profile, and start to receive client recommendations without any payment. How many lawyers are on there at the moment? The database currently covers 160,000 lawyers in 138 countries, from over 420 law firms. How do you get that information? Do you have technology that pulls it in? It’s all publicly available information which we’ve managed to collect ourselves. The client recommendations. That’s one of the centerpieces of the site, isn’t it? Our market research showed that clients use recommendations from their colleagues and network contacts eight times more than they use the existing directories. So the recommendation functionality in Top 3 Legal allows a client to recommend a lawyer without the client’s name being made public. But the client also has the ability to share recommendations on a named basis with people within his organization and his wider network. So if you’ve got a large corporate instructing lawyers all over the world, they can now build their own team sheets of which lawyers they would recommend. So if one of their colleagues in Italy decides they need some tax advice in New York, they will be able to see whether any of their colleagues have recommended a New York tax lawyer. Recommendations influence the search results, is that right? So those lawyers with more recommendations will appear higher up? 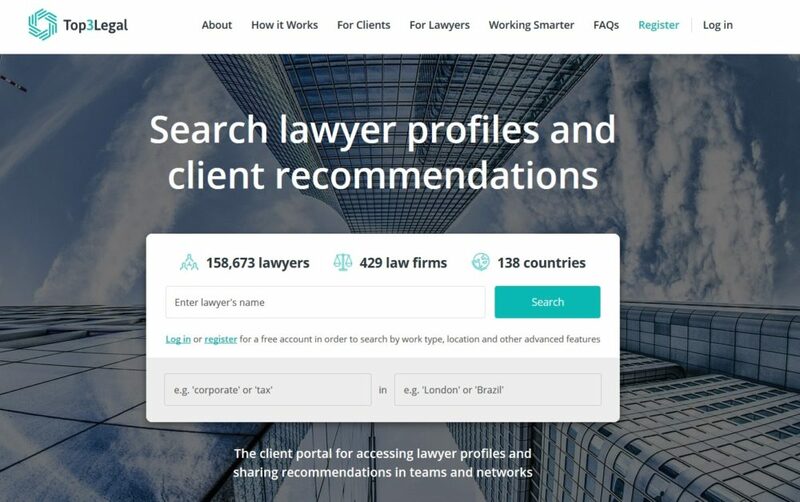 The client will see how many recommendations a lawyer has in total, but can also see how many of his colleagues and wider network recommended that lawyer. Users can click to see which of his or her colleagues have made the recommendations. As well as the recommendations, there’s filters. So if you’ve got a large number of lawyers, you want to narrow that selection down, you can do so by practice, location etc… Can you explain how that works? So if you initially searched for corporate in Italy, you get a long list of lawyers and you will then be able to click on the filters to select Milan, Rome or wherever. Similarly, if you’re an oil and gas company and you want to find a sanctions lawyer in the US, you might prefer to see that the recommendations have come from oil and gas companies and you can see that by using the filters. You launched recently. What kind of response have you had? Since it went live I’ve been amazed as to how many people have found out about it and contacted us. We’ve also had a lot of interest from barristers, and that’s an area we will look at shortly. It’s a UK-based business, but you were saying that the scope is international? It’s a truly global product from the off and that’s very much driven by the fact that we believe that most times when people are looking for a new lawyer it’s a cross border search they’re carrying out. You said that you’d done some market research and found that there was frustration with the existing directory products. Do you see this as a zero-sum game? Are you hoping the firms will spend less time on other directories and more time on your site, or do you see it as a complement, running in parallel to them? What’s your sense of how you’re going to differentiate yourselves in this market? We’d like to compete by offering something different and by offering a platform on which firms can place all their lawyers. Obviously, we need to be realistic, as the likes of Chambers, Legal 500, will carry on. But we will run alongside them and offer something slightly different given the client recommendations overlay that we provide and the fact that we put all lawyers in total control of their profiles and what information they share with clients. What are your plans moving forward? Have you got some enhancements or tweaks planned based on the initial response to the site? Yes. Particularly as we go around giving demos to more firms and large corporates. They all make suggestions as to features they would like to see added to the platform. When you get a few corporates suggesting the same new feature, you really start to listen. So we will be receptive to comments from both corporates and law firms. Are you marketing principally to the private practice lawyers, or to the buyers, or both? Both, I think we need traction with both law firms and corporates and what is pleasing is that when you get a lawyer who asks a client to recommend him or her, that then brings a new client onto the platform. And similarly, if you have a client recommend a lawyer that then brings that lawyer onto the platform. You were partner at Freshfields. Do you think that’s helped you establish some credibility? We think it’s been extremely helpful as all three of us have had long legal careers, and that’s opened a lot of doors for us and people want to listen to what we’ve got to offer. When you were practicing, what was your experience with the directories? Did you engage with them? I never had much direct experience nor got the credit that I felt I deserved! That’s a function of the reality of marketing and business development teams in large law firms. They’ve got a lot of partners screaming at them: “get me in these directories”. They can’t seriously push everybody forward. They have to choose a few every year. One of the things you’ve said is that you want to appeal to younger lawyers, and there’s more pressure on younger lawyers now to show a business development plan. They can’t expect to be just fed work from a partner. They have to be more proactive. So it’s part of your vision to get those younger lawyers onto your platform? Absolutely. I think the younger lawyers out there are a lot savvier about how they need to build a market profile and reputation to enhance their career prospects, whether it’s to get promotion to senior associate or make the step up to partner. And we believe that the Top 3 Legal platform can help them do that and help them judge the strength of their client relationships. If anyone reading this wants to know more about the site, what should they do? Share the post "Q+A With Founder of New Lawyer Directory Top 3 Legal"